Apple day in Ashburton. 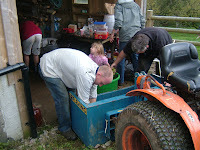 A friend's orchard, a small tractor , a crusher and a press. And last but not least, a (mostly) willing gang. 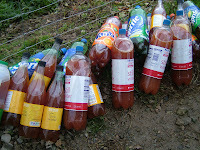 The bottles weren't especially elegant, but that's the reality of recyling. ..is a place bursting with wools in rainbow colours. It's where knitting novices are welcomed with kind hearts, cups of tea and endless patience. We went 'into the wardrobe' at Spin a Yarn as knitting virgins. Half an hour later, we were ensconced in their workroom, cuppas at hand, and already onto the third row of our first knitting assignment - dishcloths. 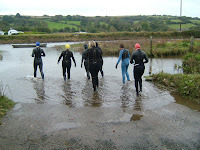 It was the third time I've swum down the Avon estuary, from Aveton Gifford to Bantham, and each time has been different. Today it was overcast and there was a strong wind constantly pushing us back. But halfway down the estuary it calmed, and we floated on our backs by the bank, under gnarled old oak trees, gazing up at the leaves and watching them fall delicately into the water. We then stopped on some mudflats in the middle and sucked on some samphire. At one point we saw the most enormous gathering of swans - I counted thirty three, with nine cygnets. In the final leg of the swim the tide raced and we were swept onto the beach. Sometimes you come across things when you're not looking for them. We were out in the woods, finding lots of hedgehog mushrooms but none of the elusive penny buns. On the way back to the car, Alex reached up to pick a small specimen by the path - and nearly trod on a beautiful plump penny bun as he did so. What camouflage eh? 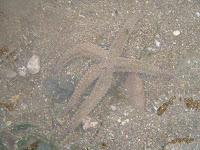 We found this handsome specimen on the beach at Bigbury. After this we swam around the fringes of Burgh Island and carried out a guerilla raid on the hotel's private Mermaid Pool - a gorgeous tidal pool with a wooden diving platform in the middle. Sadly I have no photographic evidence of this daring feat, but can confirm we did indeed dive off the platform before making our exit.